Army Santa is coming for your giant trading cards. 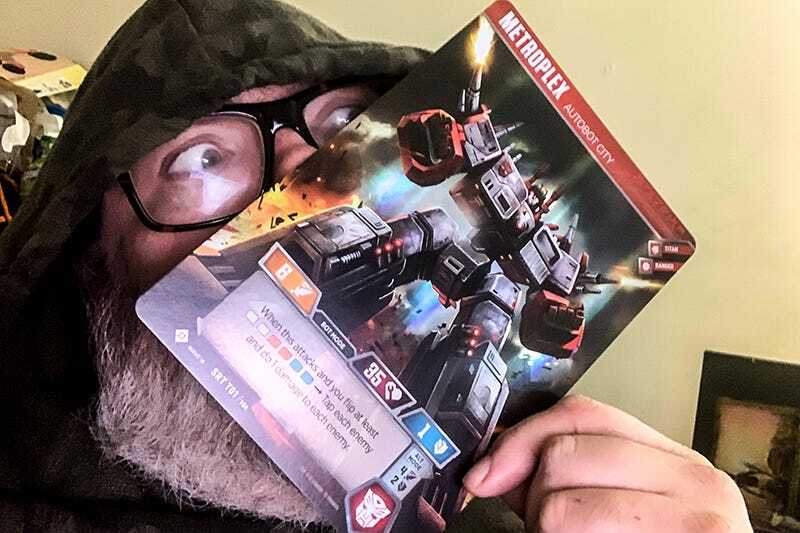 Just as I was getting used to having hero cards two times the size of the average trading card game, Hasbro releases the Metroplex deck, featuring a card as large as my face. No card should be as big as my face. In a normal round of the recently-released Transformers card game, two players pick a pair of oversized character cards to do battle, using normal-size cards to enhance attack and defense values. Character cards are double-sided, allowing players to flip between robot and vehicle/insect/dinosaur mode, with different modes having unique abilities. See how big that Optimus Prime card is? Fortunately it never needs to be held in the hand like that, but it’s still not very card box or binder friendly. With the release of the $19.99 Metroplex deck, Hasbro graduates from slightly inconvenient to just plain silly. Rather than picking two character cards to participate in battle, a player using the Metroplex deck takes control of the Autobot’s massive city robot. With 35 health in both robot and city mode, Metroplex has the staying power of two robots. Just like the toy the card is based on, Metroplex comes packaged with a trio of friends. When he flips from robot mode to city mode, his player can deploy Scamper, Six-Gun or Slammer. Scamper turns into a car, Six-Gun becomes a turret and Slammer has no alt mode, making it a rare single-sided character. So not only do we get one ginormous card, we also get three double-sized cards, with a deck of smaller cards for supplemental purposes. Look, I get it. Metroplex is a big character, the first of the game’s Titans. But just because a character is extra-large doesn’t mean the card needs to be as well. Shiva, the summons from Final Fantasy? She’s generally really huge. Look at her card from the Final Fantasy TCG. Amazing, right? Shiva is a huge and powerful character, but she fits inside a deck box. I’m not averse to having a giant Metroplex on my side of the table. It’s just that I’d recently figured out how to store the normal and double-sized cards, and now I’m going to need a bigger box. An iPhone box made the perfect storage device, until now. The Transformers Trading Card Game Metroplex deck should be taking up too much room on card store shelves starting today.